There is one part about preparing to leave which can be detrimental to my weight problems. 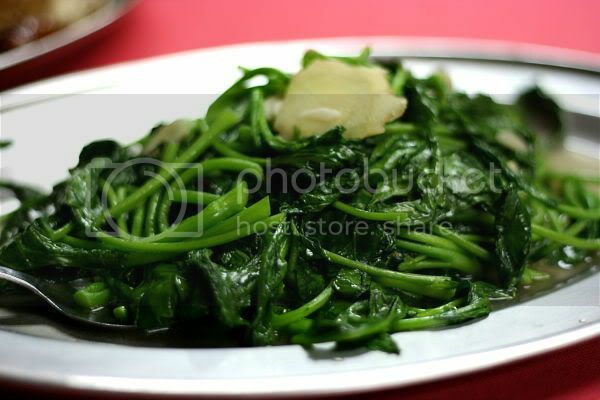 Relatives are all so eager to say, come over and visit us la, we''ll do lunch or we'll do dinner. It's obviously a good gesture if you know what I mean, they just wanna sit down and have something to eat with you, chit chat, and catch up that sort of thing. Anyway this one is with our Seremban relatives. Father in Law's side to be precise. But the trip down there is not to be wasted as our cousin brought us to try our Curry Leaf Restaurant, Jalan Rasah, Seremban. Some kinda mixed vegetable, which I did not really fancy. 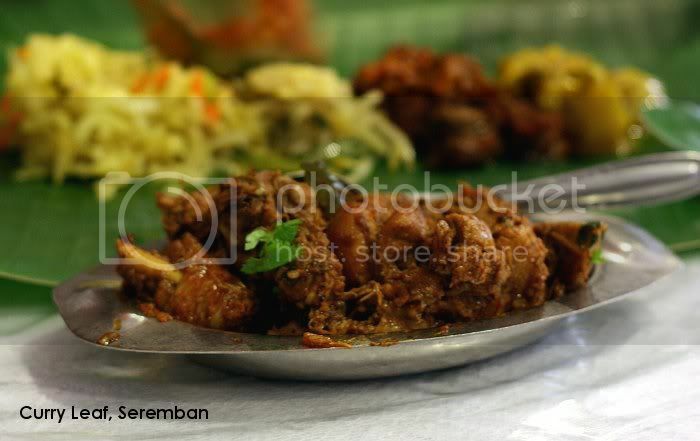 This is the chicken peratal dish that I shared with Appa. 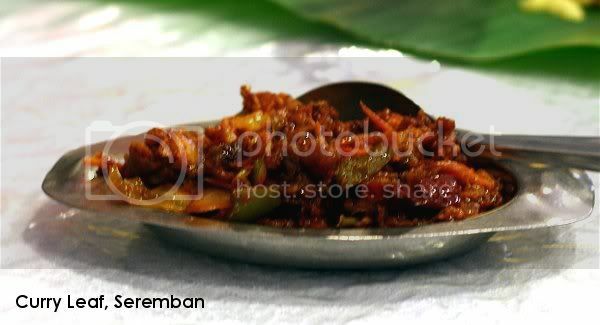 Really a nice dish, I totally didn't regret sinking my teeth into this succulent and spicy chicken peratal dish. Again, I like it because the spices were totally infused into the chicken, every bite into it flushes out all the flavours the chicken has absorbed. Mother in Law's garlic naan. She opted for bread instead of rice. 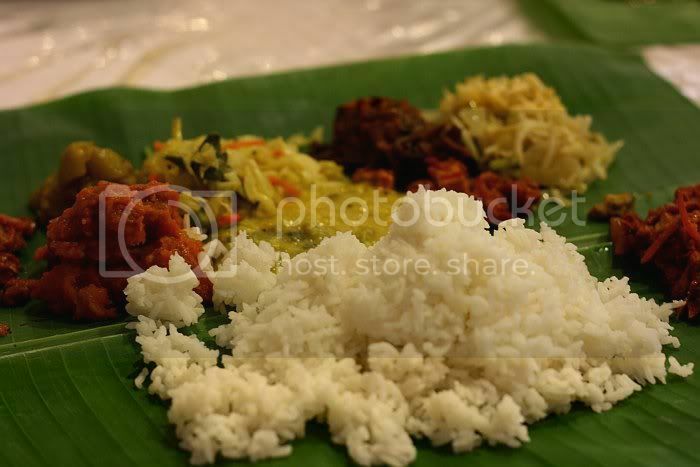 If you were going for just the basic Vegetarian Banana Leaf set, this is what you get. I mean the waiter came in once started putting vegetables onto the leaf ( 3 at first). He continues with everyone else, then he walks out for awhile. Then he came in and started putting more veges onto my leaf. 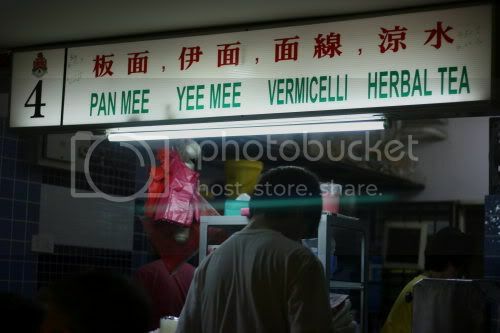 Whoa.... 6 varieties, very rare to find this even in KL, then he walks out and came back with the rice. 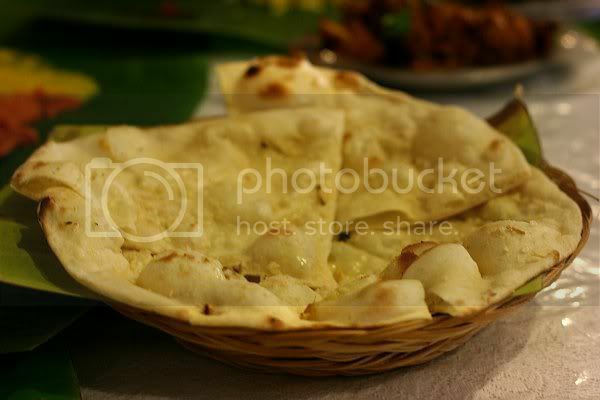 The curries were all hot, and you are given a choice of vegetarian Dal, fish curry or chicken curry. Taste wise, this place is definitely above average. The curries were tasty, what to ask for some more ? Restoran New Paris @ SS2, PJ. One major thing about Malaysian culture is that whenever someone is leaving, they always organise a farewell party in the form of a sit down dinner. If you are chinese like me, you are very likely to end up in many Chinese Restaurants. This is the first of many to come and just two weeks from the day we leave. Pastor was first to ask us out for dinner. Although we have already had many sessions at our apartment (nye hehehe...), this dinner was with Pastor and family. We were looking for a place in PJ to eat and Pastor asked where do you want to go ? Immediately New Paris came up, and we ended up there. First dish we got was Stir Fried Vegetables. Very green, and nice. Also a very decent sized serving. The yam basket was also nice. 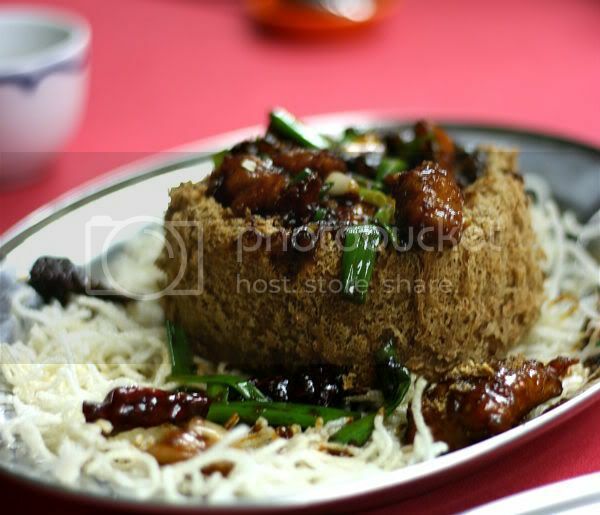 It has the usual deep fried beehoon base, a small yam basket, but the chicken that came with it was diced in bigger than usual cubes. 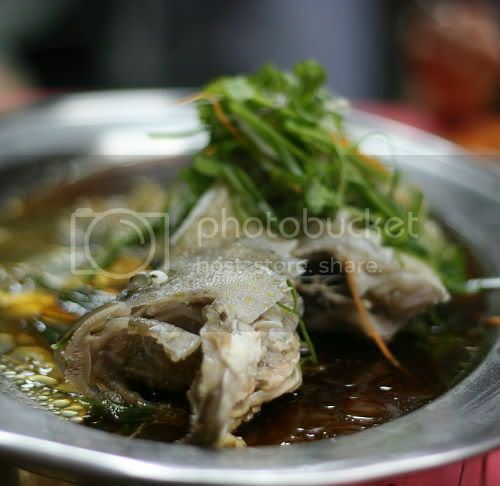 This steam fish was cooked just nice. One of their specialty dishes over at Paris is this one. 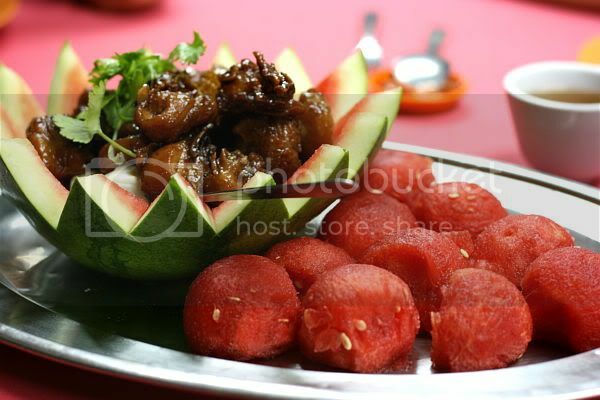 Watermelon chicken. Sweetish, and sourish, easily mistaken for pork and all. Its a nice dish and is a hit with most visitors at New Paris. 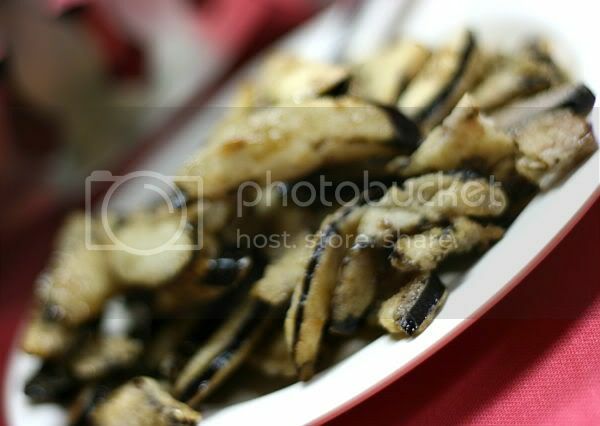 A late addition to whatever he ordered earlier was this Deep Fried Brinjal wedges. That would be how I desribe them. Really very nicely done and not too salty. A recommendation. You know what really surprises me is how fast the food is served after ordering them. The food usually comes in less than 10 minutes (usually la ! ). Sometimes the really nice stuff is hard to find, because they are not always as visible, or appealing for the general public to just walk in and say try their food. This place in OUG, is actually situated at one of those food stalls behind, OUG Parkson ( formerlly known as Yaohan). The stall just looked like just any stall, but as Ben led us through the back alleys of OUG Parkson coming through the main road, that revealed this hawker center in OUG, it didn't look very appealing. But since Ben brought us here, it couldn't be that bad right. Anyways, the wait would have been quite long if it had not been for Ben sharing with us his interesting experiences, and Sayang catching up with him and all. Both Ben and I went for the dry pan mee, which was recommend. 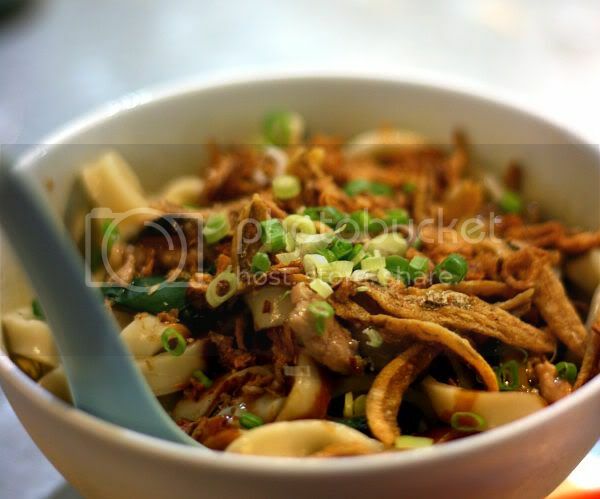 Make no mistake, it is just remotely similar to the dry chilli pan mee, from Kin Kin. But I have to say it was quite nice. 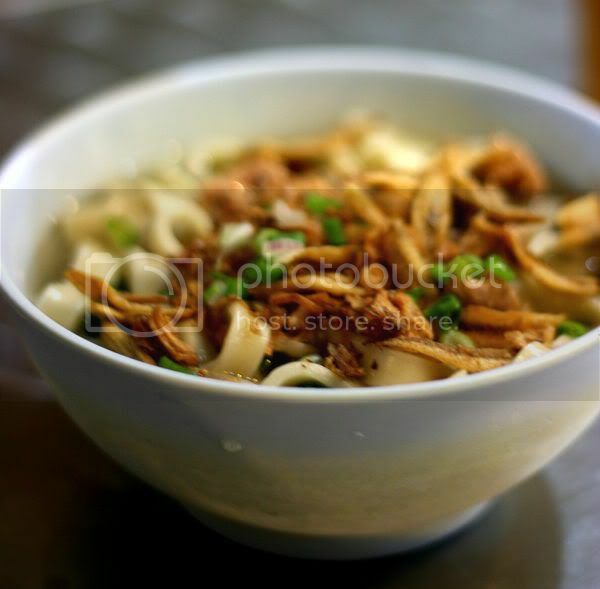 Sayang wanted to be different and went for the standard pan mee soup. I tasted abit of her soup and found the soup very tasty and rich in flavor. That kind of taste you find in real soup which has been boiled for hours.